Just hours after the Australian man 'Craig Steven Wright' outed as the possible real identity of Satoshi Nakamoto, the anonymous creator of Bitcoin, Australian Police raided his home in Sydney. 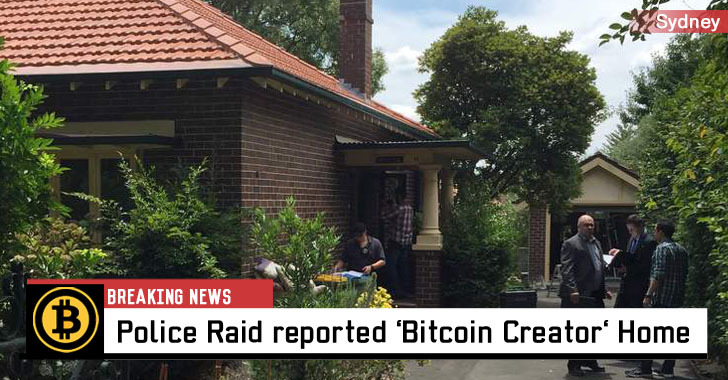 However, the Sydney police raid at Wright's home is not associated with the claims of his being involved in creating Bitcoins, rather related to the Australian Taxation Office investigation, the Guardian reported. Wright was recently identified as the mysterious creator of Bitcoin, based on leaked transcripts of legal interviews and a number of emails and blog posts. However, neither Dr. Wright nor anyone else has publicly confirmed the real identity of the founder of Bitcoin Satoshi Nakamoto. In a statement, the Australian Federal Police (AFP) officers said the raids weren't at all associated with the recent Bitcoin claims on Wright. "The AFP can confirm it has conducted search warrants to assist the Australian Taxation Office at a residence in Gordon and a business premises in Ryde, Sydney," the police said. "This matter is unrelated to recent media reporting regarding the digital currency bitcoin." Wright appears to be persuading the Australian Taxation Office to tax his Bitcoin holdings as a currency and not as an asset. Nakamoto reportedly has some 1.1 Million Bitcoins to his name in a trust fund that amounts to roughly 455 Million in US Dollars — the same amount that Wright is believed to own. The recent investigations hinted at a direct link between Wright and Nakamoto, but the evidence could be fake in whole or part and there is a possibility that Wright could also be the wrong man. Maybe the Australian Taxation Office authorities will have the better luck in figuring out the mystery — The Face behind Bitcoin.